Stars: Mads Mikkelsen, Maria Thelma Smaradottit. 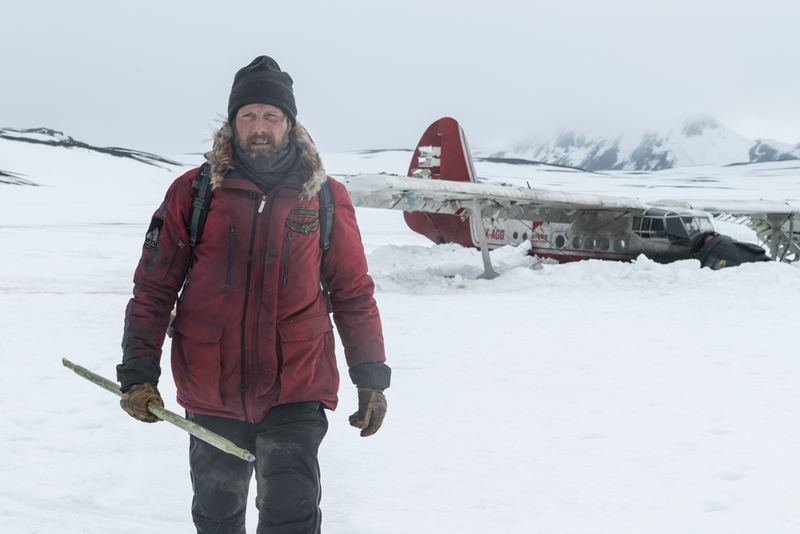 Danish star Mads Mikkelsen (The Hunt, tv’s Hannibal, etc) virtually plays a lone hand in this grim tale of endurance and survival set in the frozen wastelands of the North Pole. The film will recall other survival dramas like All Is Lost, in which Robert Redford played a lone role as a sailor stranded at sea after his yacht was struck by a floating cargo container, or Cast Away with Tom Hanks stuck on a desert island with only a volleyball for company. In Arctic the setting is much more extreme and the stakes are a lot higher. Mikkelsen plays Overgard, a pilot whose light plane crashes in the Arctic. We never see the plane crash, and we are thrown straight into the drama a few days afterwards. Overgard has set up a rudimentary camp in the wreckage where he remains relatively free from the elements. He has established a daily routine that does become a little repetitive. He slowly uses rocks to erect a huge SOS sign, he tries to get a signal on the radio, and he fishes through a hole in the ice. Then he sees a rescue helicopter approaching, but it spins out of control and crashes. Overgard reluctantly makes his way to the crash site where he finds the female pilot (played by Icelandic actress Maria Thelma Smaradottir) badly injured. He manages to effect some basic first aid and takes her back to his plane. Then he tries to drag the badly wounded woman across the harsh snow covered wilderness using part of the fuselage as a makeshift and crude toboggan. And somewhere not too far away is lurking a polar bear, which poses a threat. Arctic is the first feature film from Brazilian director Joe Penna, who initially began his career making short films for Youtube and directing music videos. Penna co-wrote the sparse script with his regular collaborator Ryan Morrison, who also edited the film. This is visual storytelling, and the film is stripped back to the essentials with minimal narrative and dialogue. There is very little flab to be found in its brisk 97 minute running time, and Penna effectively builds up the suspense. Shot on location in Iceland the film looks great thanks to the crisp widescreen lensing of cinematographer Tomas Orn Tomasson who brings the harsh, inhospitable snow covered environment to life, which enhances the dangers. This is an immersive, effective and visceral film and you can virtually feel the cold. Joseph Trapanese’s score suits the tone of the piece. Mikkelsen is on the screen the whole time and he holds our attention with a committed and quite physical performance. He eschewed the use of stuntmen, which lends an authenticity to the gruelling survival story. This is a virtuoso turn from Mikkelsen, who is often cast as the villain, and he delivers an understated and largely internal performance. We are not give backstories for the two characters, but we don’t really need any as we are fully invested in their desperate struggle to survive.Arctic marks an auspicious debut for Penna, and it will be interesting to see how he follows this film.